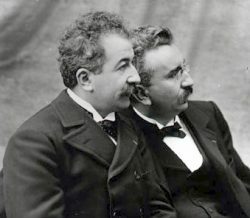 The Lumière brothers, born in Lyon, were renowned engineers in the late nineteenth century. They played a leading role in the evolution of photography and filed numerous patents in the field. They were very much encouraged by their father, a photographer and businessman who owned several plate and film manufacturing plants. The Lumière brothers are known as the inventors of cinema as we know it today, after many improvements of course. However, the discovery of the cinematograph – or kinetographer – was the result of several decades of research on image and photography. Moreover, the very term “cinema” implies projection. As early as 1891, it was possible to make a montage reel showing several photographs taken in succession, therefore reproducing the illusion of movement. However, in order to view this movement, a small apparatus called the kinetoscope was needed. Louis and Auguste Lumière therefore took up the idea and in 1895 performed mechanical experiments based on the functioning of the human eye to give an illusion of movement. This double ‘performance’ made it possible both to record images and to project them using a crank arm. On 23 February of the same year, the famous brothers filed the patent for their discovery. Then, on 22 March, they presented this new tool that promised a world of wonder… and given what cinema has become over time, this was no understatement. Not only did they invent an innovative tool, the Lumière brothers also produced the first ‘films’, in this case ten short videos (less than a minute) showing various things, such as workers leaving a factory, and the sea. The first paying public screening of these small films took place on 28 December 1895 before a public of thirty-three people in Paris, before being exported to America. They were a huge success. Lyon opened the first public cinema school in 2015: the Cinéfabrique. This school offered five training courses: scenario writing, production, image, sound, and editing. These were three-year courses, accessible via an entrance exam, but without any other academic prerequisite i.e. a high school diploma was not required. However, the number of places was limited and competition was high. Once a students, however, it was possible to ask for a grant. In 1990, a miniature museum and cinema were opened in Lyon’s Old Town, with an exhibition surface of nearly 2000 sq. m; it is classified as a UNESCO World Heritage Site. Here, you can admire models of real film sets, and see the evolution of special cinematographic effects, making this museum a unique place in Europe. The Institut Lumière was founded in 1982 and established in the Monplaisir district of Lyon, in memory of the Lumière factory where the first film was made. This institute aims to promote the activity of the cinema and its history. You can find a museum, cinemas that project old films. It also organises film festivals. Cinema is above all a means of communication and expression. The primary goal is to promote the know-how and values of a country and, while today we celebrate American productions more than others, remember: it all began in Lyon! More information about findings in Lyon, contact us !